Home > Blog > APSE News > Blog > February 2018 > If you love the Americans with Disabilities Act, it’s time to call your representative! If you love the Americans with Disabilities Act, it’s time to call your representative! It’s Valentine’s Day, which is a day to celebrate the things and people we keep close to our heart. With a bill to amend the Americans with Disabilities Act (ADA) gaining traction in the House, it’s time to call your representative to express your love for the ADA and share your opposition to HR 620. APSE has created an easy way to contact your representative in less than 60 seconds! Help in the effort to stop the ADA Education & Reform Act of 2017. You can use the following talking points when reaching out to your Representatives in the House. For more talking points, visit this website from Disability Rights Education & Defense Fund (DREDF). Removes incentives that are currently in place that hold businesses accountable for making themselves accessible. Places the heaviest burden on individuals with disabilities to enforce the ADA – the very group that the law is designed to protect. No other group of citizens is forced to wait 180 days to enforce their civil rights. Does not address the primary concerns that the bill was designed for – to curbing fraudulent lawsuits. How do I reach my representatives? Email your representative in less than 60 seconds! Find your House representative and call their offices. Also known as the “ADA Notification” bill, HR 620 would weaken the ADA by making it hard for people with disabilities to participate and engage in their communities. If passed, HR 620 places the burden for monitoring accessibility of public buildings on people with disabilities. The ADA Education and Reform Act upends both the intent and purpose of the ADA. 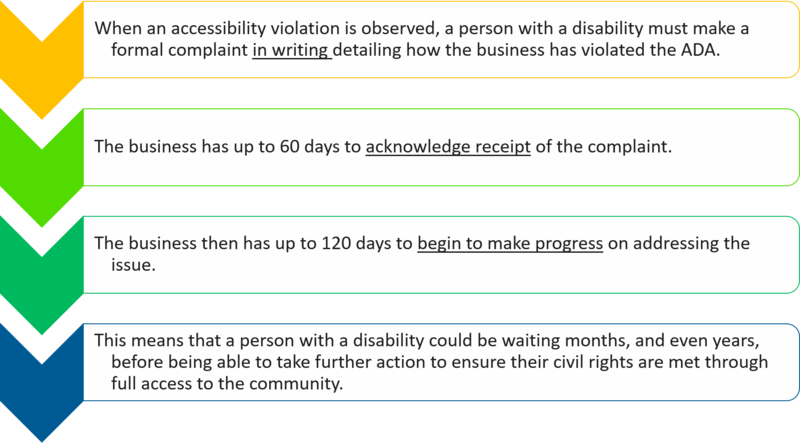 This means that a person with a disability could be waiting months, and even years, before being able to take further action to ensure their civil rights are met through full access to the community. For more information about HR 620, see the Consortium for Citizens with Disabilities website: Myths and Truths about the “ADA Education and Reform Act.